Lenders Mortgage Insurance is often misunderstood. If you’re borrowing over 60% of your property you could be charged LMI and you should definitely read this. If you don’t think you will be charged LMI, you should read it anyway. Lenders Mortgage Insurance; Reduced Equity Fee; Loan Equalisation Fee; Mortgage Insurance and LMI. They are all the same thing, but let’s call it LMI for the sake of keeping it simple. When you arrange a mortgage, your lender may ‘ask’ you to pay LMI. Most people understand that when a lender holds out their hand for money, it must be paid or they simply don’t get the loan. But there’s a lot more to LMI than that. Each lender has individual rules on when they will insist you pay LMI. They are not required to advertise their policy and they do not include LMI in Advertised Comparison Rates, Personal Comparison Rates, or Keyfacts Sheets. While some lenders only charge LMI when you borrow more than 80% of the value of your property, others may charge LMI on every loan. As Unbiased is independent and works solely for you, your adviser will quote individual premiums into all comparisons when LMI applies to you however if your bank or broker doesn’t tell you whether LMI applies to your loan or how much it will be other than burying it in your loan contracts. As we know, by the time you’re reading those, it’s often too late. But that’s not the end of the story and definitely not all you need to know about LMI. Premiums are exponential and based on the lender. It’s neither unusual nor impossible for LMI premiums to vary by 60% or more between different lenders for this once off, largely non-refundable fee that does nothing to protect you. Yikes. Contrary to what banks and brokers might tell you, the same scenario arranged with different lenders almost always results in different LMI premiums – even if all lenders use the same insurer. This is a sample LMI premium curve for the same loan amount at common LVR points. Premiums usually rise sharply as LVR increases. There are five factors that influence the premium you will be charged. The first and most obvious is that one lender may insist that you pay for mortgage insurance while another may not. It comes down to an internal policy. The second factor is that LMI fees, like premiums on most insurance policies, are risk and exposure based. Exposure relates to the amount of money the insurer may have to pay in the event of a claim. Risk relates to the likelihood that the insurer will have to pay out on a claim. A major part of that risk, relates to how confident the insurer is in the credit policy and practice of the lender, which of course, is the one that’s insured. If the insurer considers one lender to be more risky than the other, they charge a higher premium. In every day terms think about the same Holden Commodore insured with the same insurer for same amount. If a fifty-year-old driver living in the country were to comprehensively insure that car, his premium will probably be a lot cheaper than an eighteen year old male who keeps the Commodore parked on the street in a high-theft, inner-city area. Even though both people are insuring the same car for the same amount with the same cover, it’s the driver’s statistics that make all the difference to the cost of the premium. Your mortgage is the Commodore. Your lender is the driver. The third factor influencing how much you will pay for LMI is whether the lender subsidises the mortgage insurance premium and to what extent (yes, it actually does happen). If your lender adds LMI to the Amount You Want to Borrow before calculating the actual premium, then you can really jump thresholds as the LVR is beefed up by the extra borrowings for the LMI itself. Although this practice seems to have disappeared, never underestimate the chance that it could resurface. The fifth and final factor influencing the cost of LMI is which insurer your lender uses. Although there are two open access mortgage insurers, a good number of lenders have self-insured options including ANZ, Westpac, St George and ING to name a few. Although this does not automatically make these lenders or their mortgage insurance options better or cheaper, it might. It also makes anyone who tries to convince you that LMI premiums are ‘pretty much the same’ either a big fat liar or just plain ignorant. The trick to understanding who or what is covered by LMI is to recognise which word to emphasise – it’s Lenders Mortgage Insurance. It should really be written “Lender’s Mortgage Insurance”, however it rarely ever is. LMI is a very expensive insurance policy which may be triggered if your lender forecloses on your property. It protects them against a shortfall between the sale price of the property and the amount you owe to your lender. Your lender takes out this insurance to protect themselves then decides how much of the premium will be paid by you. Although you generally pay the lion’s share of that premium, LMI gives you no protection at all. The bad news does not stop there. If a mortgage insurer pays out a claim, they are then able to recover that money and associated expenses plus interest, from you. Going back to our car insurance example, it’s a lot like paying the insurance premium for a person driving the car in front of you. If you slam into the back of their car the insurance company takes care of them by fixing up the damage. No charge. No fuss. However even though you paid the premium plus interest, you are not insured by the policy and neither is your car. Worse still, the insurance company, which you paid, can and will probably sue you for the cost of the repairs to the other person’s car. If you want to be protected, you must take out and pay for another policy as well. Putting all that aside, LMI can keep you locked into a dud loan, which is just one reason banks and many brokers have few qualms about arranging it. LMI premiums, like income tax, are calculated on a sliding scale. 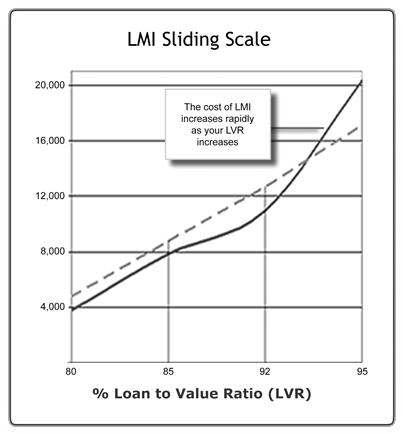 This scale works increasingly against you if you increase either your Loan Amount or Loan-to-Value Ratio (LVR). A small change to either of these variables can result in a massive change in the premium if it steps you into a new threshold. Any estimate a lender gives you over the phone can be wildly different to the premium on your loan contracts. Lenders have different rate scales, meaning that the Loan Amount and LVR thresholds where premiums leap either up or down are different between lenders. Lenders have different abilities to determine when and how much you will pay in LMI. Paying LMI may restricted the lenders and loans available to you. If you’re paying LMI you will probably be charged a higher interest rate too…. A double whammy! At the end of the day, LMI is only a part of the Total Individual Cost of your mortgage. Unlike the costs many borrowers focus on, such as interest rate and ongoing fees, LMI is incurred at the beginning of the loan, in a lump sum. You don’t just pay LMI; you end up paying interest on it as well! In instances where you find yourself refinancing within two years, your lender might offer a partial refund and we do mean partial. The maximum refund around at the moment is 40% when a loan is refinanced in the first year. This falls to 20% if your mortgage is paid out in the second year. There is no refund after that and the refund policy varies from lender to lender. Investigating cross collateralisation or guarantor options. Do as many of these things as you sensibly can and make sure it’s included or ruled out as a cost. Of course the simple way to do all of this for at least 31 lenders receive bonus monthly commission rebates is to speak with Unbiased. Click here to arrange a confidential, obligation free chat with an Unbiased Mortgage Broker. This article is adapted from Mortgage Free Debt Free, 5 Steps to the Fast Track and is reproduced with publisher permission.